8:30 a.m. Sandite Golf at Sapulpa Tournament. 6:00 p.m. Sandite Baseball vs. Jenks. Sand Springs/Sapulpa Joint Board Meeting - CANCELED. 8:00 a.m. Lady Sandite Golf at Bishop Kelley Tournament. 12:00 p.m. Lent Devotional Time and Lunch. 5:00 p.m. Sandite Softball vs. Jenks. 6:00 p.m. Sand Springs Cultural and Historical Museum Trust Authority meeting. 6:00 p.m. Sandite Baseball vs. Jenks, Youth Night. Free admission for kids in jerseys. Youth are invited to join the high school team on the field for the national anthem. 6:00 p.m. Lady Sandite Soccer vs. Owasso. 8:00 p.m. Sandite Soccer vs. Owasso. 9:00 a.m. Sandite Golf at Owasso Tournament. 8:00 a.m. Lady Sandite Golf at State Preview Tournament. 8:00 a.m. Lady Sandite Tennis at Claremore Tournament. 5:00 p.m. Lady Sandite Softball vs. Owasso (Double-Header). 6:00 p.m. Sand Springs BMX Free Open House. 6:00 p.m. Lady Sandite Soccer vs. Capitol Hill. 8:00 p.m. Sandite Soccer vs. Capitol Hill. 3:30 a.m. Sandite Track and Field at Muskogee Classic. 7:00 p.m. Sandite Baseball vs. Union, Senior Night. 7:30 p.m. Free Concert featuring Halo Jordan, Jim Barritt, Pastor Pudge and Sister Sludge Redneck Revival. 6:30 p.m. Sandite Baseball vs. Sapulpa. 7:30 p.m. Free Concert featuring Halo Jordan, Jim Barritt, Pastor Pudge and Sister Sludge Redneck Revival, Branded, Sonny and Trish Moody, James and Vanessa Lacey. 3/16-6/3 - Unseen India exhibit at Charles Page Cultural and Historical Museum. 4/25 - 30th Annual Sand Springs Education Foundation Hall of Fame Banquet. 5/1 - Opening Day at Sand Springs Splash Pads. 5/3 - Incredibles 2 at Case Community Park. 5/3 - Mayor’s Cup Softball Tournament. 5/3 - 5/4 - 9th Annual 100 Mile Yard Sale. 5/3 - 5/5 - WSA Cup. 5/6 - Sand Springs Chamber Open Forum (Speaker: Lt. Governor Matt Pinnell). 5/7 - Junior High Girls Basketball Tryouts. 5/9 - High School Girls Basketball Tryouts. 5/10 - Unity Praise: Fire on the River. 5/11 - Charles Page High School graduation. 2:30 p.m. Sand Springs Community Theatre presents Dan Neidermyer’s Aladdin. 8:00 a.m. Sandite Tennis at Bartlesville Tournament. 9:00 a.m. Lady Sandite Golf at Owasso Tournament. 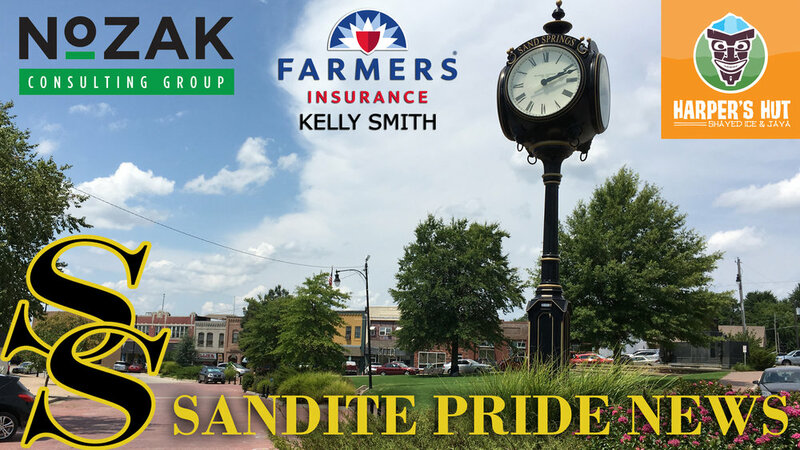 1:30 p.m. Sandite Softball vs. Jenks. 4:00 p.m. Sand Springs Planning Commission meeting. 5:30 p.m. Sand Springs Public Schools District Dialogue. 6:00 p.m. Sand Springs Board of Adjustment meeting. 6:00 p.m. Sandite Baseball vs. Ponca City. 7:00 p.m. Sand Springs Public School Board of Education meeting. 8:00 a.m. Sandite Golf at Bishop Kelley Tournament. 8:00 a.m. Lady Sandite Tennis at Bartlesville Tournament. 12:00 p.m. 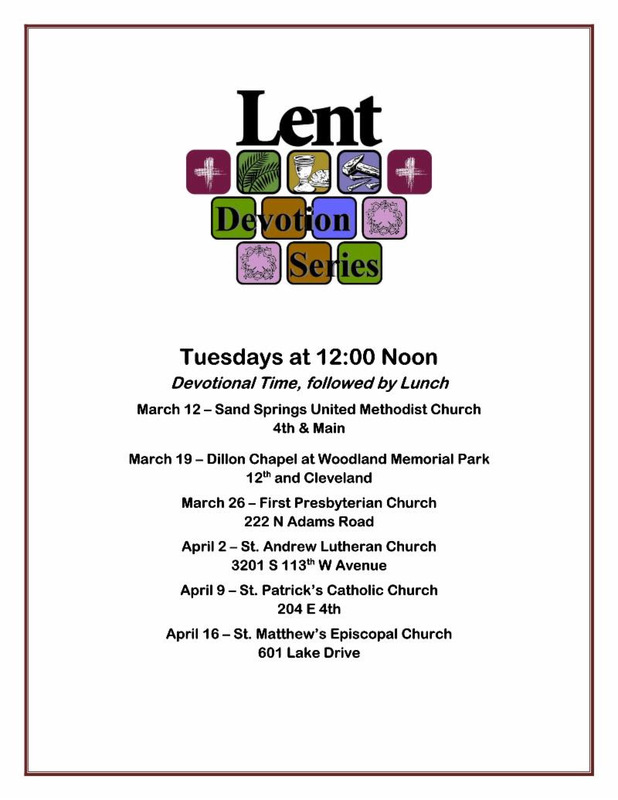 Lent Devotion Series and Lunch. 5:00 p.m. Lady Sandite Soccer vs. Shawnee. 7:00 p.m. Sandite Soccer vs. Shawnee. 8:30 a.m. Lady Sandite Golf at Sapulpa Tournament. 11:30 a.m. Sand Springs City Council meeting. 8:00 a.m. Sandite Golf at Frontier Valley Conference Championship. 1:30 p.m. Sandite Baseball vs. Booker T. Washington. 5:00 p.m. Lady Sandite Softball vs. Broken Arrow. 10:00 a.m. Sandite Track and Field at Yukon Classic. 4:00 p.m. Sandite Baseball vs. Jenks. 6:00 p.m. Lady Sandite Soccer vs. Union. 8:00 p.m. Sandite Soccer vs. Union. 8:00 a.m. - 10:00 a.m. Case River Run 5K and 1 Mile Fun Run. 8:00 a.m. - 3:00 p.m. 30th Annual Herbal Affair and Festival. 9:00 a.m. - 4:00 p.m. 2nd Annual Westival. 1:00 p.m. Sandite Baseball vs. TBA. 2:00 p.m. Sandite Golf at Jenks Tournament. 3:00 p.m. - 6:00 p.m. Pokemon Go! Community Day. 5/10 - 3rd Annual Unity Praise event. The Sand Springs Education Foundation recently announced its 2019 Hall of Fame inductees. Sheilah Bright (Class of 1979) and Scott Palk (1985) will be honored at the annual Hall of Fame Banquet on Thursday, April 25th at 6:00 p.m. in the Ed Dubie Field House. The SSEF provides district teachers with grants for special equipment, supplies, and student projects. The Hall of Fame Banquet is one of their biggest annual fundraisers. Table sponsorships are available at $400 for eight seats, and individual tickets are $50. The dinner will be preceded by a silent auction at 5:30 p.m.
To purchase tickets or request further information, contact Tirita Montross at 918-798-1517. Bright is a forty-year veteran journalist, publishing her first article at 15 years of age. She has contributed to numerous magazines and newspapers and was part of an Emmy Award-winning script-writing team for Narrative Television Network. She was a driving force behind Operation Gold Pride, which raised more than $600,000 for Sand Springs Public Schools. She also recently opened the Bright Morning Farm event center. Palk graduated with a Bachelor’s of Science from Oklahoma State University in 1989 and a Juris Doctorate from the University of Oklahoma in 1992. He served as an Assistant District Attorney for Cleveland County from 1992 to 2002 and was an Assistant United States Attorney from 2002 to 2011. He has worked as Deputy Criminal Chief and Anti-Terrorism Advisory Council Coordinator. From 2011 to 2017 he was Assistant Dean of Students and Assistant General Counsel at the University of Oklahoma College of Law before being commissioned as a U.S. District Judge. Palk won Prosecutor of the Year awards in 1993 and 2004. In 2011 he was awarded the Director’s Certificate of Appreciation for Assistance to the Federal Bureau of Investigation’s Joint Terrorism Task Force. Hall of Fame inductees are required to have attended Sand Springs Public Schools for at least three years after the Sixth Grade, or to have spent at least eight total years in SSPS, or to have spent the last two years of high school in SSPS and to have graduated from the district. They must have attained a position of “unusual respect, impact, or influence in the community,” or have attained regional prominence in their field, or to have attained an exception level of accomplishment in their field. 9:00 a.m. Sandite Golf at Coweta Tournament. 12:00 p.m. Sand Springs Chamber of Commerce Open Forum. 5:30 p.m. Sand Springs Parks Advisory Board meeting. 6:00 p.m. Sandite Baseball vs. Broken Arrow. RESCHEDULED: Sand Springs Public School Board of Education meeting. Regular monthly meeting set for April 8th. 5:00 p.m. Lady Sandite Softball vs. Barnsdall. 5:00 p.m. Lady Sandite Soccer vs. Edmond Santa Fe. 7:00 p.m. Sandite Soccer vs. Edmond Santa Fe. 8:30 a.m. Lady Sandite Golf at Jenks Tournament. 12:00 p.m. Sand Springs Women’s Chamber meeting. 4:30 p.m. Lady Sandite Softball vs. Kellyville. 6:00 p.m. Sandite Baseball vs. Bartlesville. 7:00 p.m. Sand Springs Community Theatre presents Dan Neidermyer’s Aladdin. 10:00 a.m. Sandite Track and Field at Reasor’s Track Classic. 6:00 p.m. Lady Sandite Soccer vs. Norman. 8:00 p.m. Sandite Soccer vs. Norman. 6:15 p.m. Sand Springs Band Boosters BINGO Night. 6:30 p.m. Family BINGO Night. 7:00 a.m. - 3:00 p.m. Chipper Days. Free chipping on limbs up to 2” in diameter. Free wood chips and firewood while supplies last. Must bring City water bill to prove residency. 8:00 a.m. - 2:00 p.m. Hike With Your Dog Day. 1:00 p.m. Sandite Baseball vs. Yukon. 3/5-3/31 - All-Black Towns of Oklahoma exhibit at Charles Page Cultural and Historical Museum. 4/13 - 30th Annual Herbal Affair & Festival. - Read More. Sand Springs City Manager Elizabeth Gray provided an update on the Sheffield Crossing Development Infrastructure Construction project at Monday evening’s City Council meeting. The City purchased 18 acres of Highway 97 frontage from OmniTrax in December of 2017, on the former site of the Sheffield Steel Mill, with the intent of constructing a commercial development. City leaders hope to attract a large lumber/hardware store as an anchor for the Sheffield Crossing development. Craig & Keithline Inc. has developed the initial infrastructure package, including an entry roadway, traffic signals, and storm and water facilities. Two new traffic signals will be installed on Highway 97 as part of the project. One will be located at the entrance to Sheffield Crossing, and one will be located at the future intersection of the Main Street expansion. That intersection will join Main Street and Highway 97 with the new road planned along the top of the levee in Case Community Park. Council approved a resolution waiving competitive bidding for certain traffic signal components for the development. The project deadline has already been pushed and the City hopes to save a few weeks on the delivery and installation of the traffic signal poles by purchasing them directly. Gray commented that the massive piles of demolition rubble currently on the site will be used as filler within the development. Council approved a resolution declaring the City’s intent to apply for a Community Development Block Grant from Tulsa County Community Development Urban County funds. The City expects to be allocated approximately $94,748 which will be used for a water line replacement project from 4th Street through 6th Street on Lincoln Avenue. The City will be replacing 980 linear feet of 4” cast iron line with 8” PVC line. One of the conditions for receiving CDBG funds is that recipients must implement an action to further fair housing. To comply, Council unanimously approved a resolution proclaiming April 2019 as Fair Housing Month. Council unanimously approved $46,769 for the purchase of park amenities from Happy Playgrounds. The funds will provide for five park benches, 30 trash can sets, and 14 picnic tables for Case Park. $6,354 will come from the existing Case Park Project fund, and $40,415 will come from the remaining 2014 GO Bond funds. Council unanimously approved a resolution affirming Dilapidation Public Nuisance administrative hearing findings for buildings at 104 North Franklin Avenue, 810 1/2 North Franklin Avenue, 313 North Industrial Avenue, and 704 1/2 North Washington Avenue. The resolution authorizes the City to demolish the buildings on or after May 13, 2019 at the expense of the property owner. Council unanimously approved an expenditure of $5,250 to We B Trees for stump grinding and the planting of five trees in the downtown Triangle District. The funds will be taken from the General Fund Economic Development-Marketing budget. Council unanimously approved the Final Plat for a single-family gated subdivision on nine acres South of 51st Street and East of Skylane Drive. The Villas at Stone Creek Estates will include 39 lots on two blocks. Council unanimously approved the appointment of Justin Tockey to the Sand Springs Development Authority for an unexpired term to July 2021. Tockey is a Charles Page High School graduate and U.S. Navy veteran. He has experience as a Development Officer for a Methodist non-profit and is currently pursuing a certification in Financial Planning. 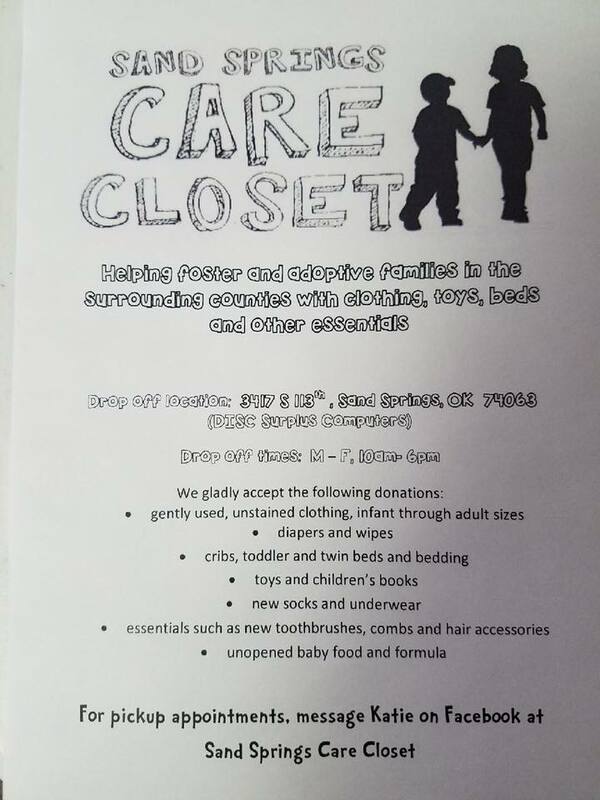 He is an active member of the Sand Springs Rotary Club, and has previously participated in the Sertoma Club and the American Legion. Council unanimously approved the selection of Daniel Bradley as the 2019 recipient of the John M. Hess Municipal Award for Outstanding Citizenship. Bradley retired in 2018 after 38 years with the City. He spend 35 years at the Police Department, working his way up to Chief of Police before transitioning to Assistant City Manager. The award has been presented annually since 2003. Council unanimously approved an amendment to a Franchise Agreement with CoxCom, LLC for E-911 services. The City has a non-exclusive franchise agreement with Cox for cable services, and the City collects a 5% franchise fee of approximately $220,000 per year. The amendment will provide an extension to the existing agreement for an additional five years. $2,100 for participation in the Oklahoma Municipal League Conference. $1,310 for participation in the Mayors Council of Oklahoma. $250 for participation in the OneVoice Day at the State Capitol. $360 for participation in Sand Springs Chamber of Commerce Open Forums. $250 for participation in Oklahoma Municipal League Day at the Capitol. $1,500 for participation in the Mayoral Council of Oklahoma Board Meetings in Oklahoma City. $3,500 for participation in the Tulsa Metro Chamber Washington D.C. Fly-In. $2,200 to cover administrative expenses for Council/Administrative Workshops and the City Budget Fair. $800 to cover City Manager/City Council Lunch Meetings. $2,000 for membership in the Sand Springs Chamber of Commerce. $3,000 for membership in the Tulsa Metro Chamber of Commerce. $535 for membership in the Homebuilders Association. $4,000 for membership in the Indian Nations Council on Government Coalition of Tulsa Area Government. $16,000 for membership in the Oklahoma Municipal League. $500 for membership in the Mayoral Council of Oklahoma. $1,000 for miscellaneous membership dues. The Sand Springs City Council unanimously approved four Special Use Permits for medical marijuana facilities at their Monday evening meeting. Council approved permits for a Cultivation Facility, a Processing Facility, and a Dispensary at 200 East Morrow Road. LightHeart Farms plans to open sometime in April in the building that formerly housed the historic Morrow Gill lumber yard. Council also approved a permit for Oklahoma Harvest Health to open a Medical Marijuana Dispensary in the Wellston Park industrial center at 1104 West Wekiwa Road. In November Council approved a growing facility at the same location. Council previously approved a slate of marijuana-related SUPs at their January meeting. Dr. Cannabis, LLC was approved for a cultivation facility and a dispensary at 3417 S. 113th W. Ave., Suite B3. Therapeutic Herbal Care, LLC was approved to open a dispensary at 1126 E. Charles Page Blvd. The Herbin’ Joint was approved to open a dispensary at 3417 S. 113th W. Ave., Suite A2. The 30th annual Sand Springs Herbal Affair and Festival will be held from 8:00 a.m. to 4:00 p.m. Saturday, April 13th, rain or shine. The beloved festival attracts nearly 30,000 individuals to the historic Sand Springs Triangle District every year. With nearly 150 vendor booths, live music, kids activities, and delicious foods, the event has something for the whole family. 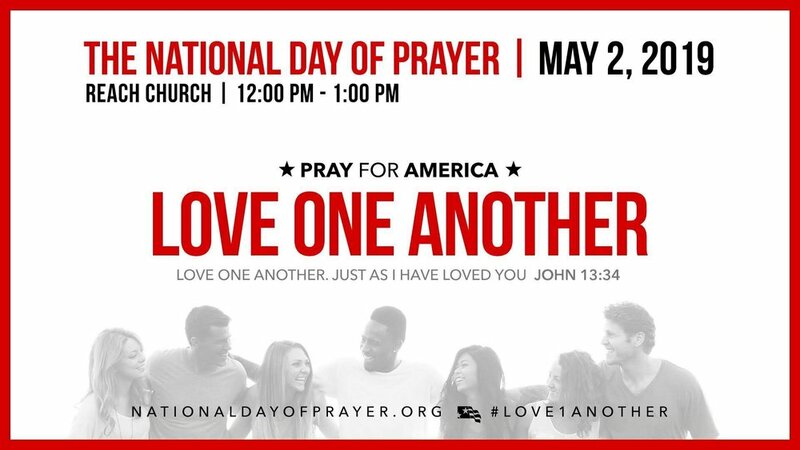 The public event will offer free shuttle services from Charles Page High School at 500 North Adams Road. Leashed pets are welcome. Church That Matters will provide a Kids Zone with a petting zoo, arts and crafts projects, and more. Special 30 year commemorative Sand Springs Herbal Affair posters (11”x17”) will be available for $5.00 each as well as colorful “30 Years and Growing” Herbal Affair T-shirts for $10.00 while supplies last. All proceeds benefit the event. 8:00 a.m. Sand Springs Herbal Affair opens, shuttle service begins. 12:00 p.m. Hometown Hero Award presented. 12:30 p.m. Janet Rutland and Shelby Eicher. 2:00 p.m. And Then There Were Two. 4:00 p.m. Event closes, shuttle service ends. For a full list of vendors, click here to visit our Event Page. Just a few blocks down the road from Herbal Affair, OkieSpice and Trade Co. will be hosting their 2nd Annual Westival event from 9:00 a.m. to 4:00 p.m. at 501 West 2nd Street. The free outdoor event will feature free tasting of products sold at the business year round. Click here for a full list of Westival vendors. 5:00 p.m. Sandite Baseball vs. Muskogee. 7:00 p.m. City Council meeting. Followed by Municipal Authority Meeting. 4:30 p.m. Lady Sandite Softball vs. Sapulpa. 6:00 p.m. Winter Guard and Drum Line Parent Show. Charles Page High School auditorium. 6:00 p.m. Lady Sandite Soccer vs. Sapulpa. 8:00 p.m. Sandite Soccer vs. Sapulpa. 8:30 a.m. Lady Sandite Golf at Bartlesville Tournament. 12:30 p.m. Sandite Baseball vs. Tahlequah. 5:00 p.m. Lady Sandite Softball vs. Owasso. 5:30 p.m. Army of Stars Banquet. 8:00 a.m. Sandite Tennis at Muskogee Tournament. 2:00 p.m. Sandite Baseball vs. Coweta. 3:45 p.m. Sandite Track and Field at 36th Annual Ram Relays. 8:00 a.m. Sandite Tennis at Claremore Tournament. 8:00 a.m. Lady Sandite Tennis at Muskogee Tournament. 10:00 a.m. Sandite Baseball vs. Booker T. Washington. 12:00 p.m. Sandite Baseball vs. TBA. 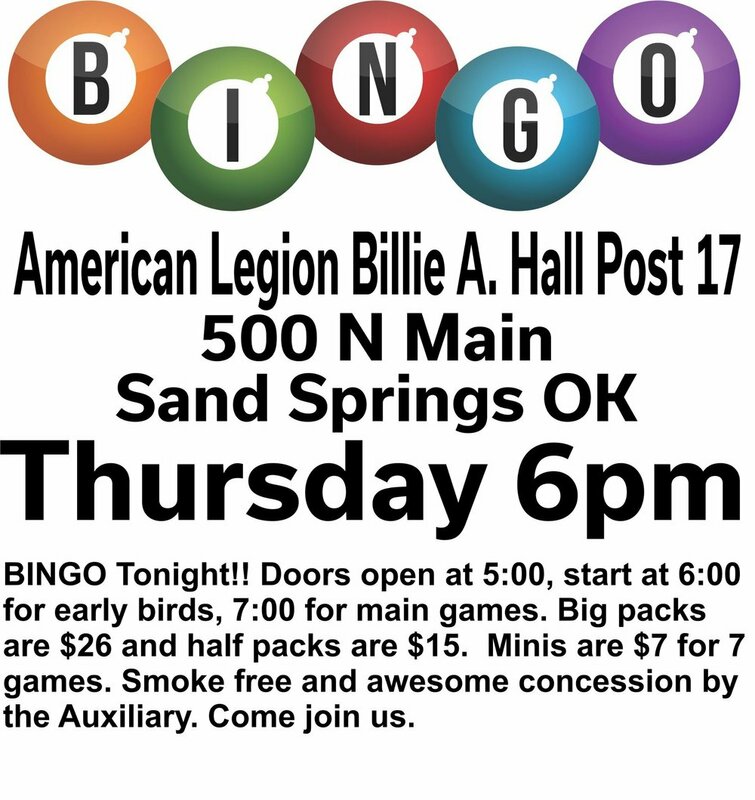 4/5 - Sand Springs Band Booster BINGO Night. 4/6 - Hike With Your Dog Day at Keystone Ancient Forest. 4/13 - 2nd Annual Westival. Last Thursday was the final day for third reading of bills in the House of origin. This simply means bills not passed off the Senate floor are dead for this session. We start the next step in the legislative process as we begin to consider House bills in Senate committees. Last year, the Legislature considered 2,289 bills, of which only 324 became law. This year, 1,061 SBs and Senate Joint Resolutions have been filed, with 429 passing off the Senate floor in time for last week’s deadline. I currently serve on five Senate committees; Education, Appropriations, Budget & Rules, Health & Human Services and the Appropriations Subcommittee on Health and Human Services. Ensuring access to quality health care and mental health care services are just two of my passions and my professional experience as a mental health therapist brings a unique perspective and skillset to my role as a legislator. Focusing on the importance of mental health, I authored several measures this year that would be another step in helping students in Oklahoma schools. Senate Bill 266 requires each school district to adopt policies related to suicide awareness and training and the reporting of student drug abuse. This includes adopting a training program and providing the program made available by the Department of Mental Health and Substance Abuse (ODMHSAS). Teachers, students, and administrators are granted immunity from employment discipline and civil liability for carrying out certain actions detailed by the measure. I authored this bill because it’s essential for more people to understand depression and suicidality and the importance of increasing awareness in our district and across the state. Just within our Senate district, schools report seeing an average of eight suicide notes a day. This is an eye-opening statistic that supports the need for increased education, programming and funding to address mental health care for Oklahoma’s students. A second bill I authored this session is Senate Bill 452, which was created as a result of an interim study between the Department of Juvenile Affairs, DMHSAS and the Department of Education to create alternatives to school suspension for students. SB 452 directs school districts to consider restorative practices instead of out-of-school suspension for students who assault school personnel. Restorative practices could include community service, requiring the student to apologize, assessment for mental health, and referrals to mental health professionals and would be made available to all students of the district. The measure specifies that school districts must provide for a student’s reengagement if suspension or alternative school settings are utilized and also asks school districts to create a threat assessment for a student convicted of a violent crime. If you are excited or concerned about any piece of legislation moving into the Senate from the House in the coming weeks; especially related to the committees I serve on, please reach out and let’s talk. Don't forget include your address so we know you are a constituent of our district. If you need help determining your Senate district, we would be happy to assist you. If you are visiting the Capitol and would like to stop by, our new office is located in Room 524. As always, on any issue please feel free to contact my office at 405-521-5600 or at Allison.ikley.freeman@oksenate.gov. Please let me or my assistant, Audra, know if we can be of assistance to you. It is an honor to serve Senate District 37 and I look forward to continuing to represent you. 12:00 p.m. - 5:00 p.m. Community Cleanup Day. Meet at the Triangle. City will provide gloves, safety vests, and trash bags. Contact 918-246-2579 to sign up. 4:00 p.m. Planning Commission meeting. 4:00 p.m. CPHS Baseball vs. Davidson Academy (Tate Aggie Classic). 8:00 a.m. 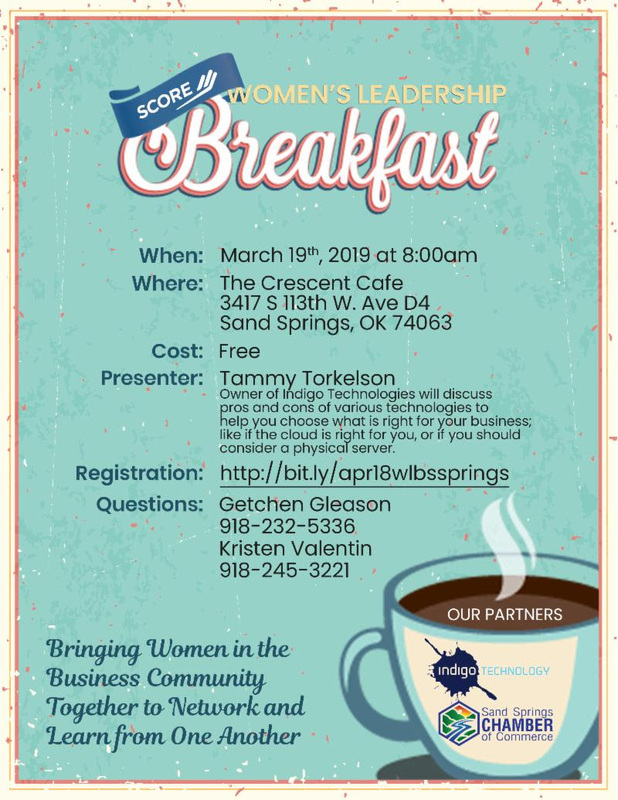 SCORE Women’s Leadership Breakfast. 6:00 p.m. Cultural & Historical Museum board meeting. 7:00 p.m. CPHS Baseball vs. Navarre. 4:00 p.m. CPHS Baseball vs. TBA (Tate Aggie Classic). 3/16 - Unseen India exhibit at Charles Page Cultural and Historical Museum. As the end of the fifth legislative week comes to a close, our focus has now shifted to hearing bills on the Senate floor. Last week was the deadline for Senate bills to be heard in committee, and at the end of that deadline there were still 511 bills in committee, with 9 failing in committee. As of the end of this week, there were 333 pending bills on Senate General Order, with 201 already passed on the Senate floor and sent to the House. Our next deadline is March 14, which is the last date for bills and joint resolutions to be heard in their chamber of origin. Any measures not heard by this date are generally considered dead for this legislative year. Many of you know one of my strongest areas of interest and focus is mental health. Before being elected to the Senate, I worked as a mental health counselor. It’s always been my belief that it’s less expensive to address mental health issues early, so early intervention in public schools is a logical place to start. Oklahoma has some of the highest rates for mental illness and substance use disorders. In 2012, Oklahoma ranked third in the nation (22.4%) in any mental illness and second in the nation (11.9%) for substance abuse disorders. This means that between 700,000 and 950,000 adult Oklahomans need services, but most are not receiving the care they need to recover from their illnesses. As the years have passed, the statistics haven’t changed much, and in some regards, have grown more even more concerning. This week, the full Senate approved Senate Bill 257, which increases the full-time employee limit from one to two employees for the State Board of Licensed Social Workers. The Board currently utilizes one full time employee and two temporary employees to supervise almost 1,500 licensed social workers. Licensure boards assist the government in fulfilling one of its main covenants to the public- protection from harm. By having specific occupations regulated through licensing government can help its citizens know when someone offering goods or services in this area is meeting basic expectations for safety of their consumers. An understaffed board translates to less thorough supervision and can lead over time to a lack of meeting the public's expectations. This change will help the State Board of Licensed Social Workers continue to meet your standards for public safety in the profession. It’s an honor to serve Senate District 37 and I look forward to continuing to represent you in the days ahead. As always, I welcome your input on concerns and issues. If you are visiting the Capitol and would like to stop by, our new office is located in Room 524. My office number is remains (405) 521-5600 and my email is allison.ikley.freeman@oksenate.gov. Please let me or my assistant, Audra, know if we can be of assistance to you. Voters in the Sand Springs Public School District overwhelmingly voiced their support for a pair of general obligation bond measures Tuesday. Proposition No. 1, totaling $32.85 million, passed with 92.83% in favor. 1,774 voted yes with only 137 against. A second proposition totaling $1.3 million passed with 91.43% in favor to provide for new school buses. The measure received 1,749 “yes” votes and 164 “no” votes. The new bonds won’t be sold until existing bonds are paid off, so the millage rate will remain the same and property taxes will not increase. Totaling more than $34 million, the two measures will provide funding for a number of projects, most notably the construction of a new freshman wing on the Charles Page High School campus. The new $14.28 million building will conjoin with the high school through the existing lobby, but will keep the freshmen separate from the upperclassmen for the majority of the day. Currently more than 75% of Central Ninth Grade Center are shuttled from downtown to the high school every day for athletics and other activities. 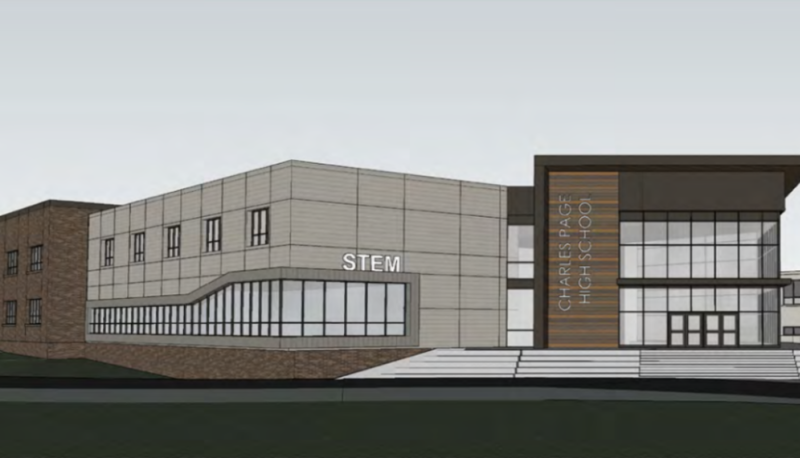 The new wing would also include several classrooms dedicated to the district’s STEM Initiative, enhancing Science, Technology, Engineering, and Mathematics curriculum. $7.2 million will go to technology enhancements throughout the district. Computer software systems will be updated to protect student data and provide mobile tech support, and WiFi will be improved and expanded throughout the district. $825,000 will go to the district’s thriving athletic programs. Memorial Stadium will get new turf, the baseball and softball fields will be regraded, and wrestling mats and other athletic equipment will also be purchased. New gymnasium/storm shelter at Angus Valley Elementary. Bleachers for Garfield Elementary gymnasium. Electrical upgrades at Limestone Elementary. Playground upgrades at Northwoods Fine Arts Academy. Playground equipment for Early Childhood Education Center. ADA Accessible bathroom at Pratt Elementary. Removal of louvers on front windows at Clyde Boyd Middle School. Kitchen equipment at all district sites. Band uniforms and elementary music equipment. Additional space for Drama Department. Sound system upgrades to auditoriums and Ed Dubie Field House. District HVAC and roofing maintenance. Books and digital curriculum for all sites. Painting, pavement, electrical, and plumbing maintenance. 6:00 p.m. Sand Springs Parks Advisory Board meeting. 7:00 p.m. Sand Springs Board of Education meeting. 7:00 a.m. - 7:00 p.m. Election Day. 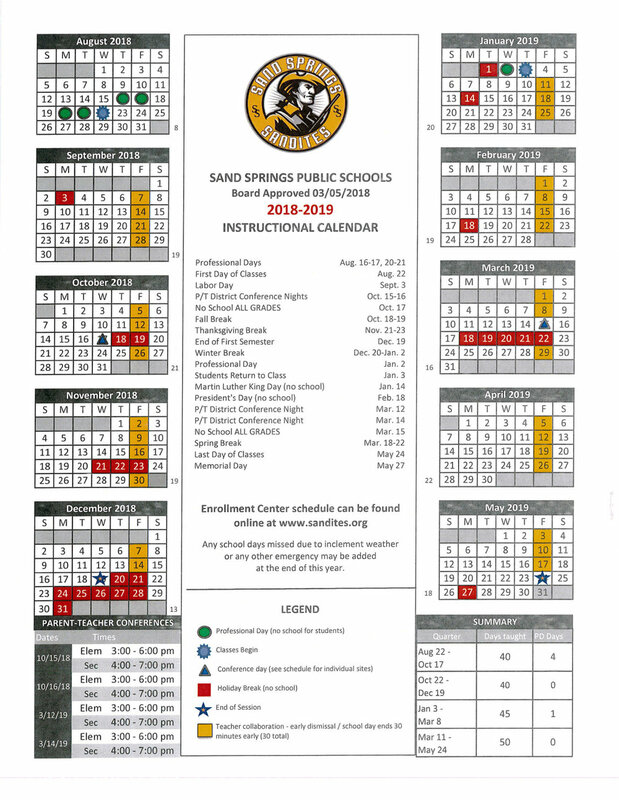 Sand Springs Public School District. 6:00 p.m. Lady Sandite Soccer vs. Tahlequah. 8:00 p.m. Sandite Soccer vs. Tahlequah. 2:00 p.m. No. 6 Lady Sandite Basketball vs. No. 12 Norman. Click here for Game Preview. 7:00 p.m. Shrek: The Musical. 9:00 a.m. OSSAA 6A Girls Basketball State Tournament Semifinals. 6:00 p.m. Sandite Baseball vs. Shawnee. 12:00 p.m. OSSAA 6A Girls Basketball State Tournament Finals. 1:00 p.m. Sandite Baseball vs. Memorial. 2:00 p.m. Shrek: The Musical. 3/16 - Unseen India exhibit debut at Charles Page Cultural and Historical Museum. 3/16 - March Town Hall with State Senator Allison Ikley-Freeman, at Pratt Library. 3/23 - Pokemon Go! Community Day. Stephen West was presented with a Sandite Spirit Award after being nominated by Head Football Coach Dustin Kinard. Kinard, who is battling pancreatic cancer, said West was an inspiration to him this past season. West is diabetic, and not quite athletic enough to see action on the varsity team. Despite this, he still showed up to every practice and was one of the hardest working players on the team. Kinard said if West could be there giving his all, then he had to show up too. Brittany Pride was presented with a Pacesetter Award for her work on the Central Ninth Grade Center yearbook. Pride is the yearbook teacher, and this year’s book was recognized by the publisher as one of the best in the nation. In addition to presenting Pride with an award, the publisher will also be using the CNGC yearbook as an example material for districts across the country. Lance Beckner was presented with a Pacesetter Award in recognition of a large financial donation to the Sand Springs Special Olympics program. Beckner’s annual donation helps send student athletes to the Special Olympics in Stillwater every year. District officials discussed the recent school grading system released by the State. According to Director of Special Services Sherry Rooks, many of the grades can be misleading due to Bell Curve grading and inconsistent criteria across school sites. For example, there are no State tests at the ninth-grade level, so the only criteria used for assessing Central Ninth Grade Center’s performance was chronic absenteeism. On top of that, the site scored an A initially, but it was dropped to a C because of the curve. According to Track and Field Coach Mike Burdge, the City of Sand Springs Parks and Recreation Department is donating their time and expertise to construct a throwing surface for the high school discus and shot put teams. The Board accepted the resignations of Rebecca Price and Lance Beck and the retirements of Becky Hatchett and Janie Abernathy. The Board approved the appointments of Greg Morris as Board Treasurer, Terri Kennedy as Assistant Treasurer, and Lynne Graves as Encumbrance Clerk. 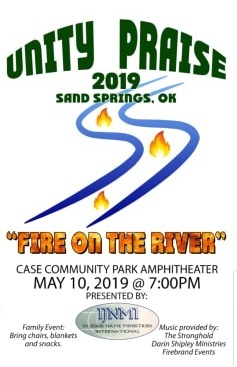 Board approved a lease agreement with the Mabee Center at Oral Roberts University for the CPHS Graduation ceremony on May 11, 2019. Board approved the purchase of two fourteen-passenger Type-A Mini Buses, a Special Education Bus, and two 71-passenger Regular Education Buses. Shawn Beard and JJ Smith to attend the International Society for Technology Education (ISTE) Conference in Philadelphia in June. Lauren Hamilton, Paige Vann, and Amy McAllister to attend the Trauma Informed School Conference in St. Charles, Missouri in June. Megan Sowers, Rachel Ellis, and Sallem Tullis to attend the National I Teach 2nd Grade Conference in Las Vegas in July. Chris Corbin to attend CrossFit Kids Training in Fenton, Missouri in April. Andrea Campfield and Jaden Salazar to attend the National Shakefest Competition in New York City in April. Sandites will take to the polls Tuesday to voice their support or opposition of a nearly $33 million bond proposal. The Sand Springs Public School District is hoping to pass two General Obligation Bond Propositions that would provide funding for a number of projects, most notably a new Ninth Grade Center and STEM Academy. The current Ninth Grade Center is located at 14 West 4th Street in downtown Sand Springs. It is the oldest building in the district and is the former site of Sand Springs High School. According to district officials, more than 75% of freshmen are shuttled to the high school campus every day for classes, athletics, and other activities. The district hopes to spend $14.28 million on a new Ninth Grade Center on the campus of Charles Page High School. The building would be partly connected to the High School through the existing lobby, but would otherwise keep the younger students separate from the upperclassmen for the majority of their day. A second proposition totaling $1.3 million will also be on the ballot to provide for new school buses. If the measures pass, the new bonds won’t be sold until existing bonds are paid off. The millage rate will remain the same and property taxes will not increase. However, Sand Springs property taxes will drop in the near future if voters choose not to approve the measures. OKLAHOMA CITY – The Senate unanimously approved legislation Wednesday to ensure young Oklahomans do not miss their first elections. Sen. Jason Smalley is the author of Senate Bill 496 to allow those who are at least 17.5 to 18 years old to pre-register to vote. Under SB 496, anyone who pre-registers to vote prior to their 18th birthday will be allowed to vote beginning on their birthday. The measure now moves to the House for further consideration. Current City Council. (Left to right): Brian Jackson, Beau Wilson, Christine Hamner, Jim Spoon, Mike Burdge, Phil Nollan, Patty Dixon. Incumbent Sand Springs City Councilwoman Patty Dixon won reelection to the Ward 2 office Tuesday with 88.9% of the vote. Dixon defeated Caleb Nelms 64 votes to 8. Dixon has served three non-consecutive terms on the council. She served two terms from 1990-1996, and filed unopposed in 2016 to fill a vacant seat. Dixon’s resume includes stents on the Parks Advisory Board, Museum Association, HEAL Committee, Sertoma Club, and Oklahoma Municipal League. She is a retired employee of the Tulsa County Parks Department and owns Dixon Auto Glass with her husband, Tim. She is also a performer in the local community theater. Keystone School Board No. C-15. 10:30 a.m. Build a Reader: Family Storytime/Stay and Play. 6:30 p.m. No. 6 Lady Sandite Basketball vs. No. 18 Bixby. 8:00 p.m. No. 5 Sandite Boys vs. Bixby. 5:30 p.m. Airport Advisory Board meeting. 11:00 a.m. No. 5 Sandite Wrestling at OSSAA 6A-East Regional Tournament. Click here for tournament preview. 6:30 p.m. No. 6 Lady Sandite Basketball vs. No. 18 Sapulpa (H). 8:00 p.m. No. 5 Sandite Boys vs. No. 4 Sapulpa (H). 1:00 p.m. - 4:00 p.m. Pokemon Go Community Day. 11/17-2/17 George Rodrigue: Shiny Happy Blue Dog exhibit. - Read More. 2/22 - Sand Springs Rotary Chili Cook Off. 2/22-2/23 - OSSAA State Wrestling Tournament. 2/23 - Hike With Your Dog Day - Keystone Ancient Forest. - Read More. 2/27 - Storm Spotter Workshop - Read More. 3/5 - Sand Springs School District Bond Election. - Read More. 3/10 - Daylight Savings Time Begins. 6:30 p.m. No. 6 Lady Sandite Basketball vs. No. 14 Bartlesville. 8:00 p.m. No. 5 Sandite Boys vs. Bartlesville. 7:00 p.m. No. 5 Sandite Wrestling vs. Bixby. 12:00 p.m. No. 5 Sandite Wrestling vs. No. 4 Edmond North. Click here for dual preview. 7:00 a.m. Fourth Annual Ancient Trail Trek. 2/15-2/16 - OSSAA 6A-East Regional Wrestling Tournament. 2/16 - Pokemon Go! Community Day. Police Chief Mike Carter was recognized for 25 years of service at Monday’s City Council meeting. Medical Marijuana took center stage at Monday night’s Sand Springs City Council meeting. Specific Use Permits (SUPs) were approved for a medical marijuana cultivation facility, as well as a dispensary, owned by Dr. Cannabis, LLC at 3417 S. 113th W. Ave., Suite B3. An SUP was also granted to Therapeutic Herbal Care, LLC to open a dispensary at 1126 E. Charles Page Blvd. Council denied an SUP to David Dietrich for the purpose of opening a cultivation facility at 15208 W. Weaver Road. The facility would have been located in a predominately residential area, and numerous neighbors requested that Council deny the permit. At a recent Planning Commission meeting, nearby residents cited concerns about the effect that a cultivation facility would have on the neighborhood’s water pressure. Nature’s Candy Dispensary was subject of discussion surrounding their name. The organization agreed to legally do business as Nature’s Apothecary at a Planning Commission meeting earlier this month, due to objections to the use of the word “candy” in regards to a medicinal substance. New objections were raised by Councilman Jim Spoon to the use of the word “apothecary.” According to Spoon, businesses dealing in marijuana are banned from using the word “apothecary” by the Oklahoma Board of Pharmacy. A motion was approved to award an SUP to the business on conditions that they not use any terms relating to pharmacy or candy. The dispensary will be located at 3417 S. 113th W. Ave., Suite A2. Oklahoma Municipal League representative Pam Polk presented a certificate to Police Chief Mike Carter in recognition of 25 years of service. Fleet Technician Michael O’Dell was not present, but will also be receiving the award. Council unanimously voted to approve a resolution of support for the Sand Springs Public Schools’ General Obligation Bond Propositions 1 & 2. The propositions total $32,850,000 and will provide funding for transportation equipment and the construction of a new Ninth Grade Center and STEM (Science, Technology, Engineering, and Mathematics) Academy on the grounds of Charles Page High School. The measures will go to a vote of the people on March 5th. Council unanimously voted to affirm dilapidation public nuisance hearing findings for a fire-damaged residential building at 405 West 7th Street. Council unanimously voted to approve a Beautification Wall project at the City’s Water Treatment Plant on the corner of Highway 97 and Morrow Road. The funding for the project was passed by voters as a G.O. Bond measure in November of 2017. Council awarded the construction project to Crossland Construction Company, Inc. in the amount of $1,113,807.60. Council also awarded an administration and inspection contract to Keithline Engineering Group, PLLC in the amount of $98,118.87. Council approved an ordinance authorizing the City of Sand Springs Police Department to remove individuals from private and public properties, without involving the property owner. The measure gives property owners the ability to inform the department of individuals banned from their property, and authorizes officers to remove that individual without first establishing contact with the property owner. This also includes nonspecific entities, such as bans on loitering or semi truck parking. Council approved an ordinance authorizing the City Manager to determine individual salaries. Council approved a $250,000.00 Title Sponsorship agreement with the Sharna and Irvin Frank Foundation, including naming rights and expanded hours with paid staff at the Keystone Ancient Forest visitors’ center. Voters approved funding for construction of a visitors’ center in a 2017 G.O. Bond election, but the sponsorship agreement will provide additional funding for increased visitors hours and a larger facility. Council approved $100,322.00 for the purchase and instillation of communication equipment for the Billie A. Hall Public Safety Center. Council approved granting an easement to OmniTrax for railroad property abutting the upcoming Main Street project in downtown. The Oklahoma Department of Transportation will be bidding the project in February of this year, with construction set to begin soon after. Main Street will be rebuilt from 1st Street south to its current terminus, with a new section of road connecting Main Street west to Highway 97. A new frontage road will also be built to connect Main Street to the Lincoln Avenue On-Ramp onto Highway 412. OmniTrax operates the Sand Springs Railway, which runs railways across Main Street, Morrow Road, and Highway 97. The easement will allow the railway to continue normal operations throughout the construction project.